Welcome to the ABC Dating initiative. Each week, we go on a date. During the first week, Evan was in charge of planning a date that had to do with the letter “A.” During week 2, Morgan was in charge of planning a date around the letter “B.” Then on week 3, Evan plans one around “C,” and the cycle continues. It gives us a chance to be creative and do things we wouldn’t do otherwise. Pretty cool right? 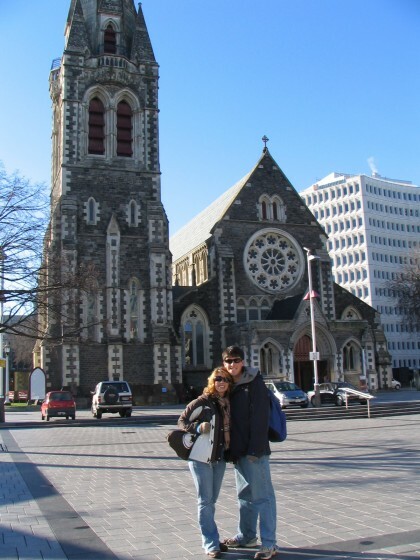 Evan was feeling lucky, so he took us to the City Centre, where you happen to find the Christchurch Casino. Now, Before you judge us for our gambling habits, you should know that casinos are a very rare thing for us. 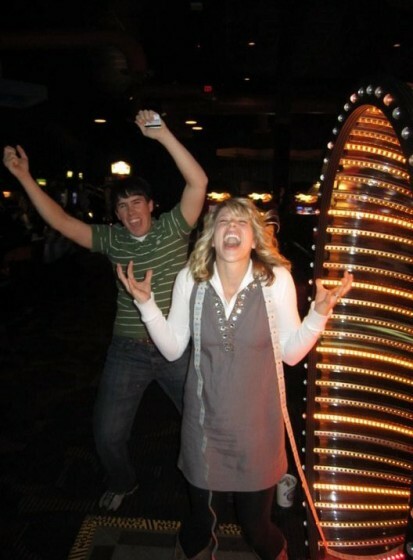 During our 3.5 years of marriage, we’ve only risked $2 in a slot machine while on a cruise. That being said, he knew to really have a fun time, we had to go all out. So we decided on a “massive” $40 gambling limit. For some reason, they didn’t let us into the high rollers room, but we still had a good time. We started by joining the players club for free, which entered us into a couple of raffles and got us a massive discount at the Grand Cafe. We each had a steak dinner, normally $22.50, for only $10! So far, so good, it was our first win of the night. We were already up on the house by $25. Needless to say, our $25 advantage on the house from dinner had now shrunk to $5. But we still had $20 to burn, so we went to a sort of wheel of fortune game. We actually did alright here, winning a few small bets to stay alive. On a whim, Morgan put a chip on the hardest to win category (a payout of 47/1), and WE WON! If that was our reaction for tickets, imagine our jubilee at winning big at the wheel of fortune! Before leaving, we had to try the coin slots, although they are really complicated these days and just confused us. So we left and, thanks to our players club card, did not have to pay for parking! Another win. – Wheel of Fortune: Spent $20, but won $70! Now that may be some fuzzy math, but we still feel like champions. Up to this point, our dates have been really fun. While this one was still really good, we did something a bit more sobering. Morgan booked a tour of the red zone in Central Christchurch. 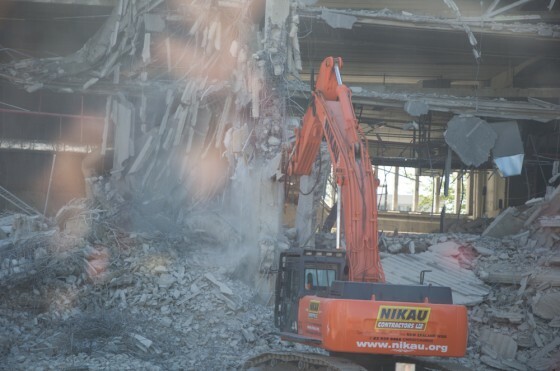 We saw the destruction from the Earthquake and the Demolition crews at work as they take down the condemned buildings. (Pardon the glare on many of our photos…we had to take pictures from a moving bus). 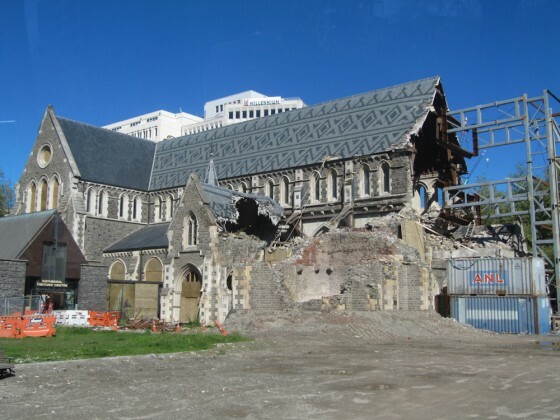 If you did not know, Christchurch was devastated by a series of earthquakes over the past 2 years-one of the most destructive being in February 2011. While you might think things would be back to normal 20 months later, it is not even close. In one sense, we were happy to see the places we loved visiting 4 years ago: Cathedral Square, Starbucks, the Bus Exchange. But in another, it was really sad to see how much damage they had endured. Most places where we had spent so much of our time while in Christchurch four years ago do not even exist now. Sometimes we feel like we are in a completely different city. Perhaps the most stunning thing was the number of buildings that seemed like they were perfectly fine, but had been condemned and still needed to be taken down. 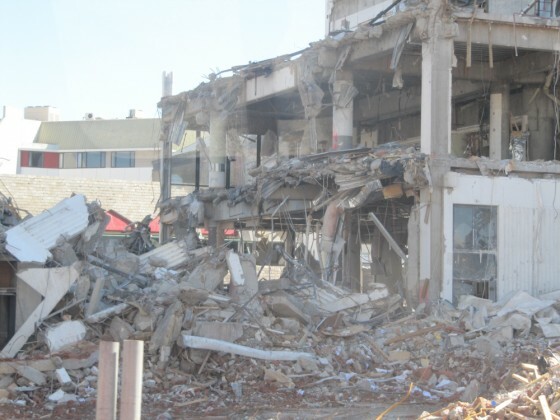 So while we were hoping to see rebuilding, they are still not even close to being finished deconstructing! While some people are (for good reason) frustrated with the lengthy process, many are excited and optimistic at the chance to build a new city. While we have no idea how to help yet, we are thrilled to be here and be part of the rebuilding process. This entry was posted in ABC Dating. Bookmark the permalink.